Written by Irene Anton on September 5, 2018 . Posted in Conferences, General News, Group activities. 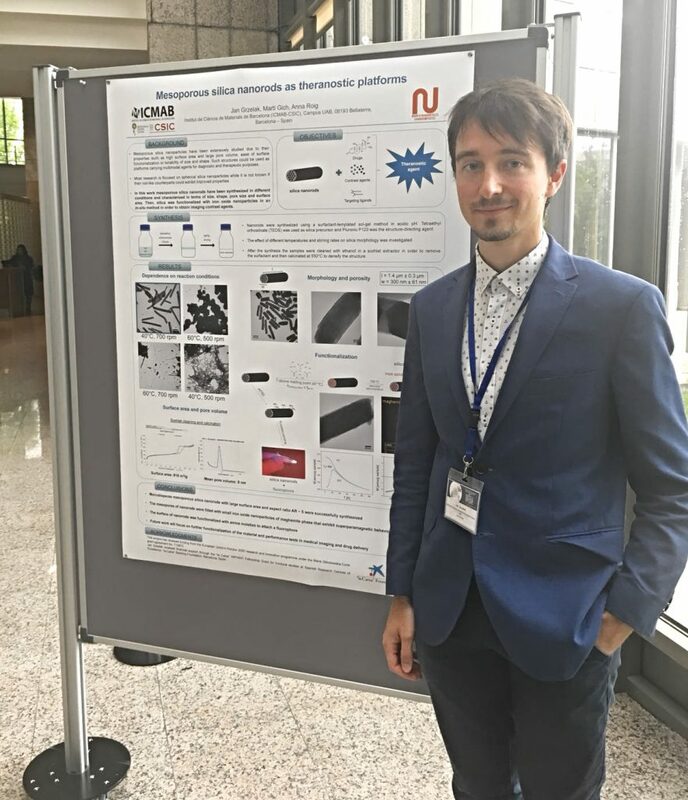 Last week (27-29 August) Jan Grzelak (PhD student at the N&N group) attended the 12th International Conference and Workshop on Biological Barriers in Saarbrücken (Germany). 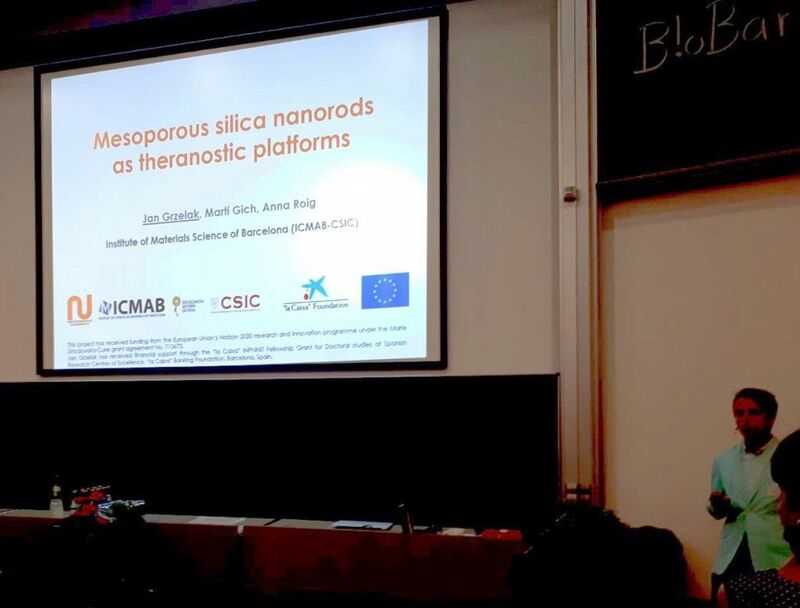 He gave a talk on “Mesoporous silica nanorods as theranostic platforms”. Good job Jan! Written by Irene Anton on November 15, 2017 . Posted in New publications. 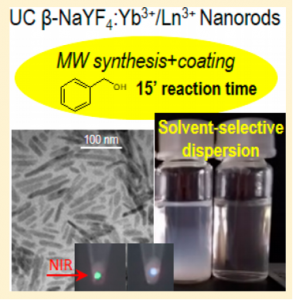 Congratulations to Anna Roig and the other co-autors for the paper: Ultrafast Synthesis and Coating of High-Quality β-NaYF4:Yb3+,Ln3+ Short Nanorods. The paper was been published this November 2017 in The Journal of Physical Chemistry Letters! Abstract: An ultrafast route to prepare up-converting single β-phase NaYF4:Yb3+,Ln3+ (Ln: Er, Tm, or Tb) short nanorods (UCNRs) of high quality was developed. This new procedure affords reactive surface nanorods that are easily coated by direct injection of suitable capping ligands. Thus highly crystalline nanorods with excellent UC fluorescence and good solvent-selective dispersion are obtained, which represents a significant advance in the field and enlarges their use for biomedical and other technological applications. Unlike other methodologies, the short reaction time provides a kinetic control over crystallization processes, and the β-phase and rod morphology is preserved regardless of the optically active Ln3+ ion. The UC emission was finely tuned by using the most popular Yb3+/Tm3+ and Yb3+/Er3+ pairs. More importantly, UCNRs doped with the unusual Yb3+/Tb3+ pair, with no ladder-like energy levels, provided a nice emission upon near-infrared excitation, which constitutes the first example of phonon-assisted cooperative sensitization to date in pure β-NaYF4 nanocrystals.